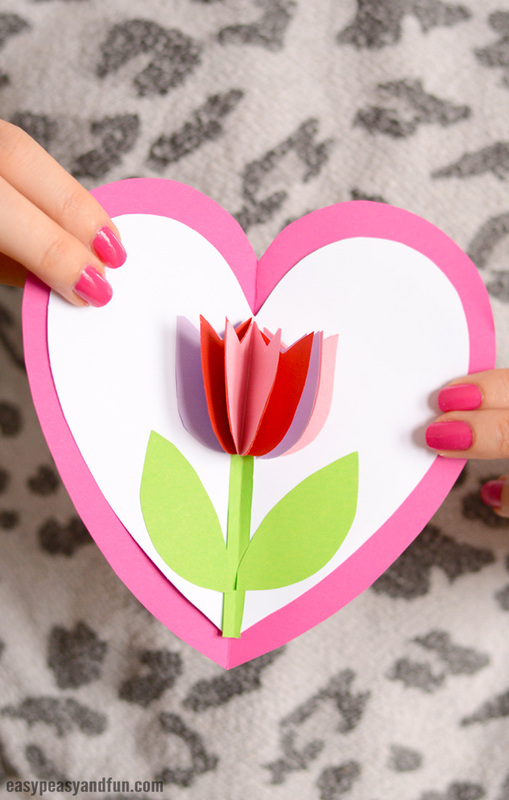 Open up the card and a heart will reveal itself, along with a nice 3D pop up tulip flower. 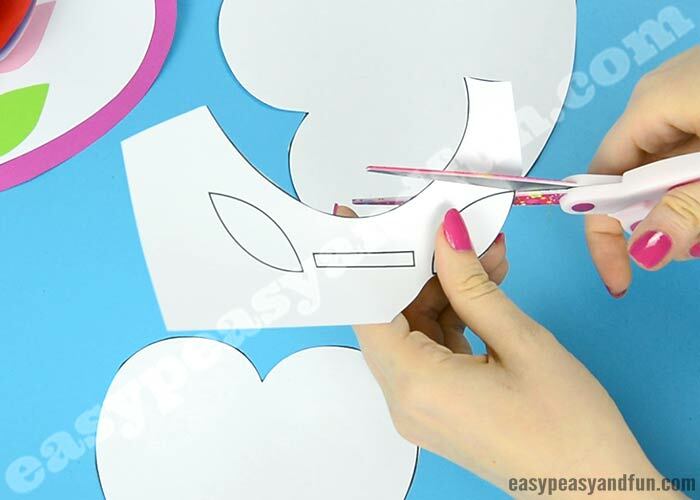 This is one of those crafting projects that can certainly be done without a template, but as we get asked for them a lot, we though it’s best to include one (you can grab it at the end of the tutorial) and also explain how to make one without the use of the template. It’s really simple. This card has just enough room on it to also scribble your very own personal message on it. Kind and warm words for a friend. Silly and adorable for the secret crush. Kind and from the heart words for mother’s day. There’s a ton of options and whatever the occasion may be, this tulip pop up cards will always be well received. If you decided to work with our template, print it out on regular print paper. 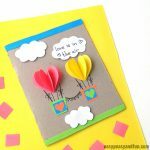 You could also print it on heavier print paper and color in all the parts to use in this project. Trace the big heart stencil on construction paper. 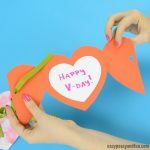 If you are working wihtout our template, I recommend folding a sheet of construction paper in half and cutting out the heart. 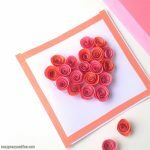 Draw half the heart shape next to the fold and cut it out, so you get the whole symmetric heart shape once you unfold it. 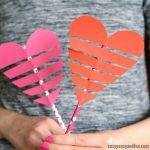 Cut out the heart shape from construction paper. Glue in the white heart (the smaller heart from the template) inside the construction paper heart. 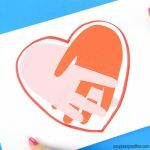 If you are working without the template, make a smaller heart than your first one and glue it inside. Trace the leaves or draw your own. Cut them out. Also cut stem. Glue the stem inside the inner heart, on the bottom at the middle. Let the glue dry. Fold the heart in half. Depending on the quality of glue, you might need to fix a few things ;). Trace the tulip flower shape on paper. You will need to trace it a few times, the more shapes the better (we had 6). 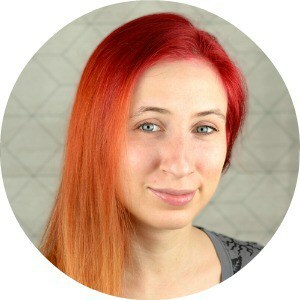 You can use the same color for all of them, or make it multicolor. Cut out the tulip flower. Without the template, you will make the tulips the same way you did the hearts, as the thing that is important is to make them symmetrical. 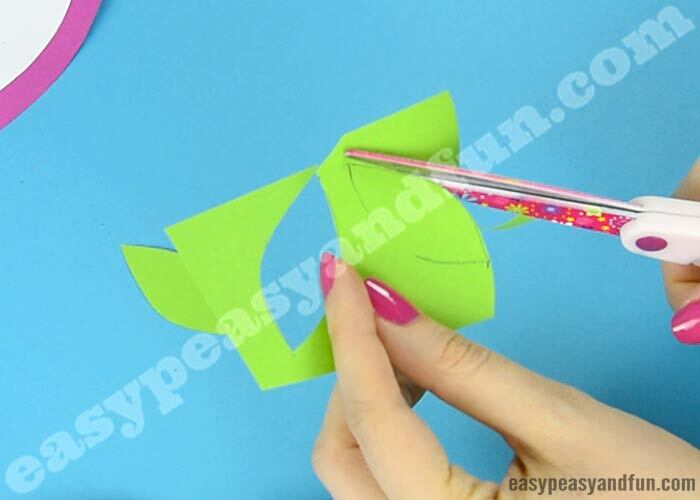 Fold the paper and cut out “half tulip” shape. 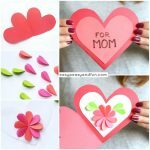 Use the first one as stencil for others or, if you are working with thin paper (print paper) you can cut multiple layers at time, making more tulip flowers in one go. Press it down into the card. Apply glue on the other half. And close the card for the glue to set. I love your paper crafts to do things with my grandchildren, but when they come I forget how to make them. I want to try to help them make this heart for their mom in a day or two so I don’t forget. These look like fun projects to do with my granddaughter!